An outbreak of respiratory disease caused by enterovirus D68 began in August of this year with clusters of cases in Missouri and Illinois. Since then 691 infections have been confirmed in 46 states in the US. The number of confirmed infections is likely to increase in the coming weeks, as CDC has developed a more rapid diagnostic test. Previously it was necessary to amplify the viral genome by polymerase chain reaction, followed by nucleotide sequencing to determine the identity of the agent. The new test utilizes real time, reverse transcription PCR which is specific for the EV-D68 strains that have been circulating this summer. Since its discovery in California in 1962, EV-D68 has been rarely reported in the United States (there were 26 isolations from 1970-2005). Beginning in 2009 it was more frequently linked to respiratory disease outbreaks in North America, Europe, Asia, and Africa. It seems likely that the virus was always circulating, but we never specifically looked for it. The current EV-D68 outbreak is the largest ever reported in North America. 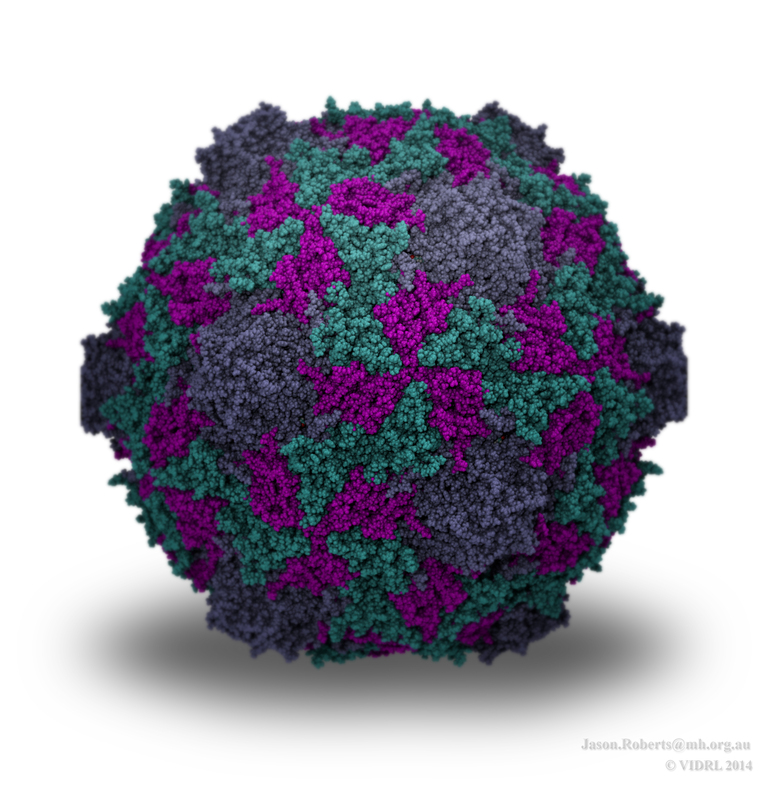 Enterovirus infections are not rare – there are millions every year in the US – but why EV-D68 has been so frequently isolated this year is unknown. One possibility is that the CDC, after the initial outbreak in August 2014, began looking specifically for the virus. Sequence analysis of the EV-D68 viral genomes indicate that 3 different strains are involved in the US outbreak. These viruses are related to EV-D68 strains that have previously circulated in the US, Europe, and Asia. The sequences are available at GenBank as follows: US-IL-14/18952, US-KY-14/18951, US-MO-14/18950, US-MO-14/18949, US-MO-14/18948, US-MO-14/18947, and US-MO-14/18946. Most of the illness caused by EV-D68 in the US has been respiratory disease, mainly in children. Five of the 691 confirmed EV-D68 cases were fatal, but whether the virus was responsible is not known. There have also been some cases of polio-like illness in children in several states associated with EV-D68. In Colorado the virus was isolated from four of 10 children with partial paralysis and limb weakness. Previously there had been one report of an association of EV-D68 with central nervous system disease. In this case viral nucleic acids were detected in cerebrospinal fluid. EV-D68 probably does not replicate in the human intestinal tract because the virus is inactivated by low pH. If the virus does enter the central nervous system, it may do so after first replicating in the respiratory tract, and then entering the bloodstream. There are no vaccines or antivirals to prevent or treat EV-D68 infection. Most infections will resolve without intervention save for assistance with breathing. As the fall ends in North America, so will infections with this seasonal virus. “…but why EV-D68 has been so frequently isolated this year is unknown. One possibility is that the CDC…began looking specifically for this virus.” Is this the best “possibility”, and that is why it is the only one mentioned? The current epidemic is unprecedented in the number of cases and vastness of the number of cases, throughout the Nation. The “possibility” the relocation program of the unaccompanied minors from Central America accounts for this unprecedented EV-D68 epidemic is a political “hot potato.” But, as scientists, can’t we take a dispassionate look at this possibility? These children were housed for long periods of time under crowded conditions before they were relocated. The possibility certainly exists that some of these children if not infected by EV-D68 before they came here, could have acquired the infection while being sheltered. The fact that relocations took place during the the so-called “enterovirus season” would exacerbate transmission. CDC has even reported these children could be infected with respiratory diseases (though the report did not involve EV-D68) [see- Nyangoma, E. N., et. al. 2014. Hospitalizations for Respiratory Disease Among Unaccompanied Children from Central America — Multiple States, June–July 2014. Morbidity and Mortality Weekly Report, August 15, 2014, 63 (32): 698-699]. Lastly, cases of EV-D68 originally occurred, at least on a county basis (as the relocation of the children has only been disclosed on state/county level) in accordance to where these children were relocated. Of course, there is a third possibility. The current strain of EV-D68 has mutated into a highly virulent form that can be transmitted, by some yet to be determined mechanism, across the Nation in a matter of weeks. The old “blame it on the immigrants” gambit is interesting only to the hatemongers on Fox News and AM radio. EV-D68 has circulated in the US for more than four decades. It was here before the parents of those poor Guatemalan kids were even born. The CDC didn’t look for it as intensively before because they didn’t have the tools to do so. Your dispassionate assessment is noteworthy. EV-D68 has been circulating globally for many years. The data are in the Lipkin paper, linked in the article. The idea of an introduction into the US is not consistent with the data. Neither is postulating an increase in virulence: the genome sequences reveal that the virus in the US is garden-variety EV-D68. Secondly, the PCR-based assay for confirming EV-D68 identity has been around for almost a decade. The CDC used this “tool” in the past years and used it so far this year to detect this virus (though they just reported they have a more rapid molecular based assay to be used in future detection assays). So, there is not some new tool that is allowing the CDC to confirm hundreds of cases this year, wherein the same tool only allowed them to detect tens of cases in prior years. Hence, we can eliminate viral strain and detection technique as variables for explaining this year’s nationwide epidemic. weeks. And, on top of that the relocation program took place during the optimal time of the year for enterovirus transmission. Moreover, there is a high correlation between where the children were relocated and cases of EV-D68. Just as an added note: I do not have an axe to grind, here. I am not a hate-mongering, right-wing idiot (as was suggested below). In fact, I’m an immigrant myself. Moreover, I’m not a Fox aficionado, nor do I listen to AM radio, other than for traffic and weather. Dear Professor- Is your professional opinion that this year’s EV-D68 outbreak should not be construed as being particularly abnormal? That EV-D68 outbreaks on the scale of this year’s may have occurred in prior years, but were only identified as “enterovirus” outbreaks? One variable you have not eliminated is ‘looking for it’, this year could be just a case of looking for more EV-D68. Perhaps there are multiple factors that explain the extraordinary surge in number of EV-D68 cases reported this year, from a total of approximately 100 cases 1962-2013, to >700, so far, in 2014. Two of the factors might include both inattentiveness by CDC to EV-D68 in prior years, and the nationwide dispersal of the unaccompanied children during June-Sept.
Next post: Would we have an Ebola virus vaccine if not for NIH cuts?